↑ "Statute of Rhuddlan". legislation.gov.uk. अभिगमन तिथि 26 जुलाई 2014. 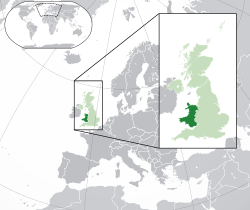 ↑ "Laws in Wales Act 1535 (repealed 21.12.1993)". legislation.gov.uk. अभिगमन तिथि 26 जुलाई 2014. ↑ "Government of Wales Act 1998". legislation.gov.uk. अभिगमन तिथि 26 जुलाई 2014. ↑ "Nominet announcement on the .cymru and .wales gTLDs". nominet.org.uk. अभिगमन तिथि 31 जनवरी 2014.